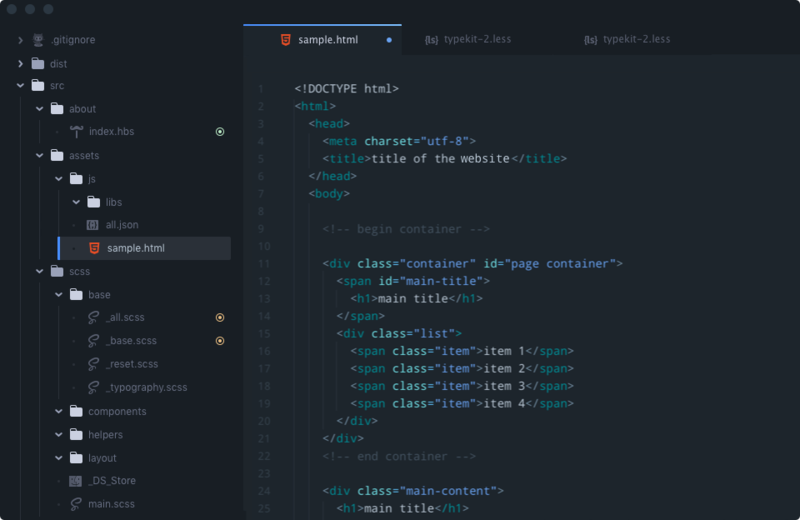 This gorgeous dark syntax theme is designed with focus in mind. City Lights Syntax Theme supports over eight most popular coding languages. More of a Visual Studio Code fanatic? We have created a Color Theme for VSC that features the characteristic City Lights colors. This icon package has over 60 file type icons and is easy on the eyes. Icons of opened files are displayed in their colored equivalent for extra focus. By popular demand; A UI theme and Syntax theme for all Sublime Text users out there who love the City Lights look. Install via package control or via CLI. Get the City Lights UI Theme to enrich your Atom setup with a dark sidebar, optimized Search & Replace toolbar, prettier error messages and many custom designed icons.